Rural Revolution: What books would you bring? On SurvivalBlog a couple of days ago, there was an interesting mental exercise about what books you would choose if you were tasked with preserving western culture against some sort of apocalyptic destruction of literature. The author listed many praiseworthy books by such luminaries as Plato, Homer, Dante, Shakespeare, Plutarch, etc., that arguably do, indeed, encompass much of western thought. As many of you know, we're book freaks in our house. We own over 5000 volumes on everything from astronomy to zoology. After reading this SurvivalBlog piece, I started doing a mental exercise of my own, namely this: if we were establishing a bug-out location and could bring, say, 100 books -- what would they be? These books wouldn't necessarily have to encompass western civilization and culture, but instead would be books we would want for both reference and pleasure. So I began wandering through our house, picking some of my favorites. I'm nowhere near 100, but I can always add to them. Some books are serious, some are shallow. This is just MY list. My husband and daughters will have broad lists of their own. • The Bible. Of course. So what about you? 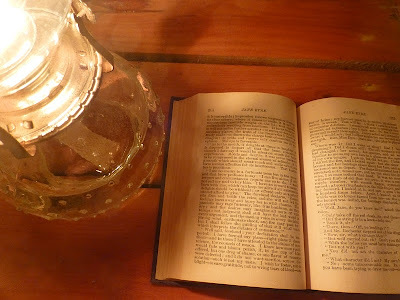 During long winter nights in your remote bug-out location, what books would you want to have available (either for pleasure or for reference) while sitting around the kerosene lamp? I like your list but with regard to Undaunted Courage, I am convinced that Meriwether Lewis was murdered rather than committing suicide. Most of the "witnesses" had an axe of some kind to grind. Hey there! Fred! I agree with you about Heinlein. The early stuff is great, and perfect for young readers during the transition years to 'adult' lit. I still reread all of them, in rotation. But 'weird' is too kind a description for the later stuff. The classic sf genre will probably come to be regarded as the 20th century's greatest contribution to world lit. Calvin and hobbes. The complete collection. I like books anyway, but have been collecting books just for the 'Lights Out' event, just in case. I like my library to have something for everyone, including children of all ages, so I have American Girl books, and Red Badge of Courage and other classics that generations of kids have been entranced by. I have a US Gov't collection including the Constitution and Bill of Rights. I have various books from the Homeschool Store including Discovering Gods World (science, including activties) Illustrated World History.My grown son likes military adventure and intrique. I have tons of survival ref and fiction, but just for fun I personally like science fiction. I also have a few Far Side comics and Maxine! Oh my, I love that Gone with the Wind is on your list. I recently was thrilled to have the guilty pleasure of seeing the film at a cinema...and sharing it with my two teenage daughters. When I was a teen ( I'm fifty one now) , my mother and her husband decided to homestead although it was not called that. We bought eighty screws in the Missouri Ozarks, cut the logs to build our house on raw land. I did the same thing with this house. I wore out two oringinal foxfire books building it. I still live as close as possiable to the same way as I can. I still make my biscuits just like Aunt Arie. I've probably exhausted my hundred already. Since I'd be doing most of the packing, do I get to pick 100 for each family member 5 and older???? Bear in mind, that would mean we'd be bugging out with 600 books. Speaking of the world, a good comprehensive history book. I have a few; not sure which one I'd pick. I don't know about Strong's Concordance, but I would definitely want a good history of the Holy Land (by "good" I mean one that presents all views). If I am going to try to teach my children religion alone, from the Bible, without a church or family or group to help supplement my knowledge, then the thing I would want most would be the ability to put the line of Kings of Israel, the House of David, the Roman govornors, Jesus, and the Apostles in a detailed historical context. AD&D Player's Handbook, DungeonMaster's Guide, and Monsters Manual (and a big bag of dice). I'm not going to get into a discussion of whether it's Satanic or not-- my $0.02 is that it depends on how you choose to use it (like anything else-- hey, I've seen the Bible used for evil purposes too). I am going to say that that silly game gave DH and me many hours of happy entertainment, is limited in entertainment potential only by the players' imagination, and could easily keep our kids happy for hours when the little ones are a bit older. A good comprehensive grammar text. I still have to teach my kids. Courage Undaunted by James Daugherty??? 1. My big, giant, fat, tome of a dictionary. 2. My hefty, thick compendium of classical piano sheet music. 4. My huge, glossy book of art history. Egads, I'm such a snob. An atlas. Excellent idea. I've added it to my list. Not the Bible. It's the most produced book in the world and easily replaceable. The Foxfire series for sure. The Harvard Classics Shelf of Fiction. Permaculture Designers Manual, my Audel's books, PDR (both normal and Herbal), Select livestock books, the Navy Foundry Manual... man, the list goes on and on. I am also working now on designing a passive library building that was a temperature and humidity stable as possible. Books are fantastic, but they degrade easily. Ah, but remember -- these books aren't for archiving cultural history. These books are for active reading during a time when spiritual comfort could be highly necessary. So yes, I'll include the Bible. I do have the full Harvard Classics, but not the fiction version, just the nonfiction. If I had room, I'd definitely bring the whole set. Indeed, the Bible is the one book that I specifically bought a "bug-out" edition: compact, acid-free paper, gilt edge, water-resistant cover. Although, technically, I believe it's present location is in my "get home" bag in the trunk of my car. Haha - Judith Levine's Not Buying It was terrible. Just terrible. I'm all for reduced consumption and simple living and you know, saving your money and being sensible, but that was one of the poorer books I've read in the genre. I agree -- that's why the book amuses me. It's so fascinating to get a glimpse into the author's mind. The Count of Monte Cristo for fun and adventure, I would want to bring my Ball canning book too. I did read The Far Pavilions at your recommendation, Patrice, it was wonderful! My favourite books on weaving, and looms: primitive looms, draw looms, Luther Hooper's; and pattern drafts. Also textile design and classic textile encyclopaedias Bossert's huge(!) folios of peasant art (to enchant bleak hours). All the best practical books, many already named. And Fred! -- (me, again) -- try John Wyndham. Alas, Babylon by Pat Frank. Probably absolutely worthless in any way except it's my favorite fiction book of all time. I have taught it in public school as literature in a senior English class before, and I read it at least once a year for pure joy. Wish I could find a Fort Repose to live in right now! It's interesting how many people put the Bible in their lists, usually #1. Perhaps we wouldn't be in such dire straits now if we all (including me) have really read it, studied it, obeyed its commands, and put it into practice in our lives, both individually and as communities. worthless? isn't that the one with the preparedness guy? I like your list, Patrice. Mine would need to contain some Edgar Rice Burroughs and some Ayn Rand....particularly Atlas Shrugged and For the New Intellectual. A Companion Bible and a Strong's Concordance would be at the top of my list. Great list. I'd add Pastor Chuck Baldwin's 'The Freedom Documents'. This amazing book contains 50 of the greatest documents of American history. What an awesome resource for homeschooling! I'd include a couple of church hymnals---I love to SING and can't remember all of the words! Ayn Rand... ideally Atlas Shrugged, for if for no other reason - an instruction manual on how to NOT rebuild society. Didn't see the Declaration of Independence, Constitution, Federalist and Anti-Federalists papers. Something the new Republic can sink their teeth into. "The Rise and and Fall of the Third Reich"
Books about classic musicians, artists etc. Whether I like it or not, our bug out location is our bug in location. We will be staying put. Being a bibliophile, we have a room dedicated as a library. It turned out to be a blessing over the years. Our now adult children used it through high school years to one college class. Now it is the grand children's turn. Your list is a good one, but we would not be interested in non-biblical books such as Jane Goodall. (Yes, I have read her books, and I have a degree in Biology). Currently, we have a good number of KJV Bibles in the house. They are at the top of the list. I would also add my incomplete collection of John Phillips' Expository Commentaries. I would like to add more. Husband has all sorts of what would be considered "manly" books, but certainly would apply to women as well. As on your list, self help medical books as well as homeopathy, and herb books. While fiction isn't my favorite, I do have Pride and Prejudice, and Sense and Sensibility, but I also purchased a book of Jane Austin's letters. The board games are also in the library. Our library is full, but certainly does not have 5,000 books on the shelves! Is civilization going to end as we know it? Will it be similar to Mad Max? I do not think anyone will be able to predict what is going to happen in the future. Unfortunately, it doesn't look pretty. The History bookcase is kinda jammed.